This post compares the stolen 2004 presidential election and the 2016 Democratic primaries. There were 50 states exit polled in 2004 and 26 primaries polled in 2016 . View the 2016 Democratic primaries spreadsheet. In 2004, Bush won the recorded vote by 50.7-48.3%, a 3 million vote margin. Kerry won the National Exit Poll by 51.7-47.0%, a 6 million margin. CO FL IA MO NM NV OH VA. Kerry needed FL or OH to win. 2004: 23 of 50 exit polls (46%) exceeded the MoE. 2016: 12 of 26 (46%) exceeded the MoE. 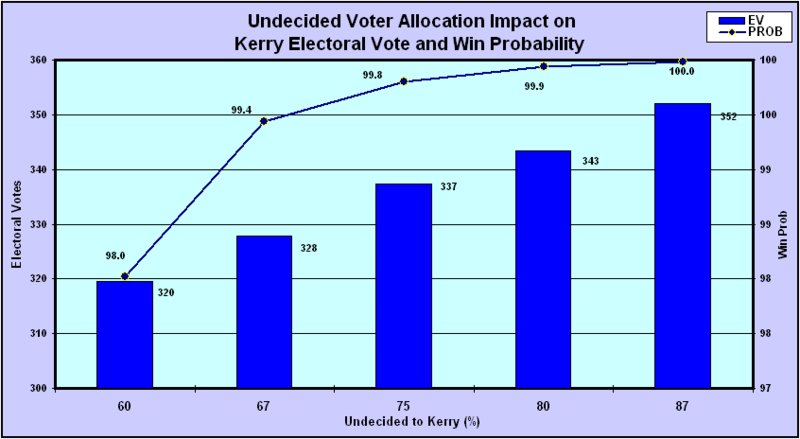 2004: 22 of 50 (44%) exceeded the MoE for Kerry. Probability: P= 1 in 600,000 trillion. 2016: 11 of 26 (42%) exceeded the MoE for Sanders. P= 1 in 76.8 billion. 2004: 42 of 50 (84%) shifted to Bush in the vote. P= 1 in 1.7 million. 2016: 24 of 26 (92%) shifted to Clinton in the vote. P= 1 in 190,000. Each simulation is based on the 2-party unadjusted state exit polls and recorded vote shares. 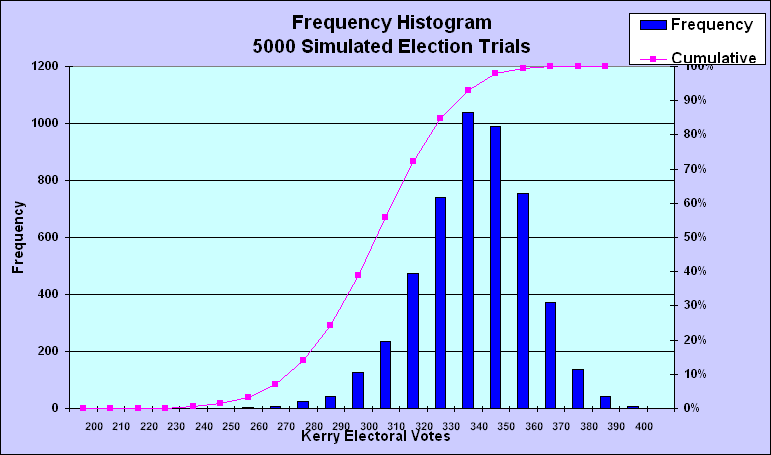 The Total Electoral Vote is calculated based on the results of 500 election simulation trials. The Electoral Vote Win probability is the number of winning simulation trials / 500. Enter an input code (1-8) in cell A6 to indicate the election and the simulation method: state exit polls or recorded votes. For example, code 3 indicates the 2004 exit polls. Gore defeated Bush by 544,000 recorded votes but lost the electoral vote. But Gore won the unadjusted state exit poll aggregate by 50.7-45.6%. Given 105.4 million recorded votes, the exit polls indicated that Gore won by at least 5 million votes. He led the exit polls in 11 states with 154 electoral votes which all flipped to Bush. If Gore had captured just ONE of the 11 states, he would have won the election. Bush had 50.5 million recorded votes in 2000. Kerry had a 48.3% recorded share and 252 EV and lost by 62-59 million votes. In order to match the 2004 recorded vote, the 2004 National Exit Poll indicated an impossible 110% turnout of 52.6 million living Bush 2000 voters in 2004. Uunadjusted state and national exit polls indicated that Kerry had 51-52% and won by 5-6 million votes with 349 EV. Seven states with 97 electoral votes flipped from Kerry in the exit polls to Bush in the recorded vote: CO,FL,IA,MO,NV,OH,VA. Kerry would have had 349 electoral votes had he won the states. The True Vote Model indicates that he had 53.5% and won by 10 million votes. Obama had a 52.9% recorded share (a 9.5 million vote margin) and 365 electoral votes. But he had a 58% share in the unadjusted state exit polls (matched by the True Vote Model) which indicates that he won by 23 million votes and had 420 electoral votes. Obama led the unadjusted 2008 National Exit Poll (17,836 respondents, 2% MoE) by 61-37%, an astounding 30 million vote margin. Only 31 states were exit polled. The unadjusted state and national exit polls were not available so the State True Vote Model shares were used for the simulation. Obama had 55% of early voters and 59% of 11.7 million late provisional and absentee ballots. But he lost on Election Day by 50-48% for a 51-47% total margin. The True Vote Model indicated that he had at least 55%. Preliminary 2016 Presidential True Vote Model: Will Jesse Ventura run? Jesse Ventura indicated in this recent interview that he might run as a Libertarian candidate. The preliminary 2016 Presidential True Vote Model shows what it would take for him to win. In this hypothetical forecast, Democratic and Republican candidates are yet to be determined. 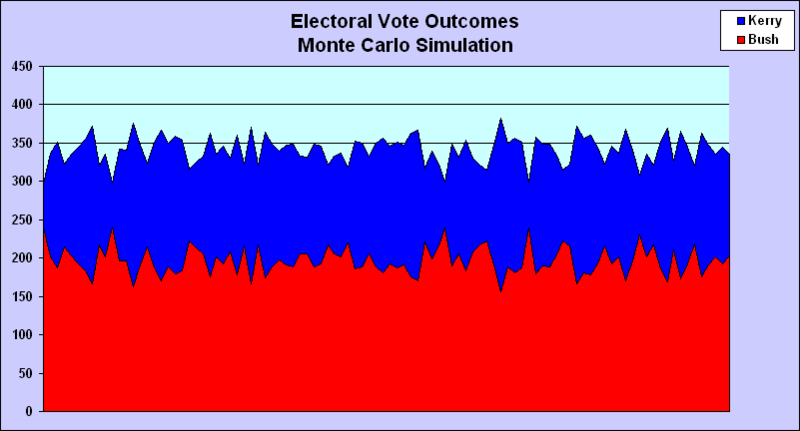 The 2004, 2008 and 2012 Election Models each used Monte Carlo simulation to calculate the probability that the Democrat would win. The three elections were fraudulent. The models utilized pre-election polls and post-election analysis: Final pre-election polls were used to forecast the recorded (bogus) popular and electoral vote. Post-election analysis was used to calculate the True Vote. The True Vote analysis shows that Kerry and Obama did much better than their recorded votes (see below). The 2004 election was stolen; Kerry won by nearly 10 million votes. Obama won in 2008 by at least 13 million more votes than recorded. The pre-election models exactly matched Obama’s recorded electoral vote in 2008 (365) and 2012 (332). Click links to the models below. The True Vote will surely differ from the recorded vote in 2016. It always does. There were 105.458 million recorded votes. Gore won by 548,000 recorded votes. But his True Vote margin was much higher. Over 5 million votes were uncounted - at least 70% for Gore. 2. Gore won the Unadjusted National Exit Poll. He won by an equivalent 2.3 million vote margin. 3. Gore won the Unadjusted State Exit Polls (50.7-45.6%), a 5.5 million vote margin. 2000 True Vote Model matched the unadjusted exit polls. Approximately 5 million Election 2000 voters died prior to 2004. Only 100 million were alive in 2004. There were 122.294 million recorded votes. Bush won by a bogus 3.0 million vote "mandate". Estimate 98% of LIVING 2000 Election voters turned out in 2004. Kerry won by an equivalent 6 million votes. The NEP required 7 million more returning Bush than Gore voters in order to MATCH the recorded vote. It indicated that 52.59 million Bush 2000 voters turned out in 2004 (43% of the vote). But Bush only had 50.46 million votes in 2000. APPROXIMATELY 2 MILLION DIED AND 1 MILLION DID NOT RETURN IN 2004. Therefore there had to be at least 5 MILLION (52.6-47.5) PHANTOM BUSH VOTERS. An IMPOSSIBLE adjustment had to be made to the National Exit poll in order to MATCH the recorded vote, therefore the RECORDED VOTE must also have been IMPOSSIBLE. THE 2000 and 2004 ELECTIONS WERE STOLEN. Kerry had 51.7% in the Unadjusted National Exit Poll. Given the 12:28am exit poll shares, matching to 51.7% required an implausible 1.4 million more returning Bush than Gore voters. But Gore won the unadjusted state exit polls by 5 million votes. 10- Kerry won by 10.6 million votes assuming 2000 voters returned in proportion to the unadjusted state exit polls aggregate. In the 1968-2012 Presidential elections, the Republicans won the average recorded vote by 48.7-45.8%. The 1968-2012 National True Vote Model (TVM) indicates the Democrats won the True Vote by 49.6-45.0% – a 7.5% margin discrepancy. In the 1988-2008 elections, the Democrats won the unadjusted state exit poll aggregate by 52-42%, yet won the recorded vote by just 48-46%, an 8% margin discrepancy. But just because unadjusted exit polls were excellent indicators of fraud in the past does not mean that they were accurate in 2016. Clinton won the Recorded vote by 48.3-46.2%. Trump led the Election Model recorded vote forecast by 44.4-42.9% which exactly matched the 306-232 EV. The media was in the tank for Clinton, the establishment candidate. In the pre-election and exit polls, Democratic Party-ID affiliation and corresponding vote shares were inflated at the expense of Independents. The True Vote Model indicates that Trump won Independents by nearly 10%. P= .000000000 000000000 000000000 000000000 000000000 000000000 000000000 000000000 000000000 000000000 000000000 0000001. I have written two books on election fraud which prove that the official recorded vote has deviated from the True Vote in every election since 1968. Except for 2016, the deviations have always favored the Republicans. Voting machine “glitches” are not due to machine failures; they are caused by malicious programming. The proof is in the 1988-2008 Unadjusted State Exit Polls Statistical Reference. Not one political scientist, pollster, statistician, mathematician or media pundit has ever rebutted the data or the calculation itself. They have chosen not to discuss the topic. And who can blame them? Job security is everything. Election forecasters, academics, political scientists and main stream media pundits never discuss or analyze the statistical evidence that proves election fraud is systemic – beyond a reasonable doubt. This site contains a compilation of presidential, congressional and senate election analyses based on pre-election polls, unadjusted exit polls and associated True Vote Models. Those who never discuss or analyze Election Fraud should focus on the factual statistical data and run the models. If anyone wants to refute the analytic evidence, they are encouraged to do so in a response. Election forecasters, academics and political scientists are welcome to peer review the content. The bedrock of the evidence derives from this undisputed fact: National and state actual exit poll results are always adjusted in order to force a match to the recorded vote – even if doing so requires an impossible turnout of prior election voters and implausible vote shares. All demographic categories are adjusted to conform to the recorded vote. To use these forced final exit polls as the basis for election research is unscientific and irresponsible. The research is based on the bogus premise that the recorded vote is sacrosanct and represents how people actually voted. Nothing can be further from the truth. It is often stated that exit polls were very accurate in elections prior to 2004 but have deviated sharply from the recorded vote since. That is a misconception. UNADJUSTED exit polls have ALWAYS been accurate; they closely matched the True Vote Model in the 1988-2008 presidential elections. The adjusted, published exit polls have always matched the fraudulent RECORDED vote because they have been forced to. That’s why they APPEAR to have been accurate. The Census Bureau indicates that since 1968 approximately 80 million more votes were cast than recorded. And these were just the uncounted votes. What about the votes switched on unverifiable voting machines and central tabulators? But vote miscounts are only part of the story. The True Vote analysis does not include the millions of potential voters who were illegally disenfranchised and never got to vote. In 1988, Bush defeated Dukakis by 7 million recorded votes. But approximately 11 million ballots (75% Democratic) were uncounted. Dukakis won the unadjusted exit polls in 24 battleground states by 51-47% and the unadjusted National Exit Poll by 50-49%. The Collier brothers classic book Votescam provided evidence that the voting machines were rigged for Bush. In 1992, Clinton defeated Bush by 5.8 million recorded votes (43.0-37.5%). Approximately 9 million were uncounted. The National Exit Poll was forced to match the recorded vote with an impossible 119% turnout of living 1988 Bush voters in 1992. The unadjusted state exit polls had Clinton winning a 16 million vote landslide (47.6-31.7%). The True Vote Model indicates that he won by 51-30% with 19% voting for third party candidate Ross Perot. In 1996, Clinton defeated Dole by 8.6 million recorded votes (49.3-40.7%); 9 million were uncounted. The unadjusted state exit polls (70,000 respondents) had Clinton winning a 16 million vote landslide (52.6-37.1%). The True Vote Model indicates that he had 53.6%. In 2000, Al Gore won by 540,000 recorded votes (48.4-47.9%). But the unadjusted state exit polls (58,000 respondents) indicated that he won by 50.8-44.4%, a 6 million vote margin. There were nearly 6 million uncounted votes. The True Vote Model had Gore by 51.5-44.7%. The Supreme Court awarded the election to Bush (271-267 EV). In Florida, 185,000 ballots were uncounted. Twelve states flipped from Gore in the exit poll to Bush in the recorded vote: AL AR AZ CO FL GA MO NC NV TN TX VA. Gore would have won the election if he captured just one of the states. Democracy died in 2000. In July 2004 I began posting weekly Election Model projections based on the state and national polls. The model was the first to use Monte Carlo Simulation and sensitivity analysis to calculate the probability of winning the electoral vote. The final projection had Kerry winning 337 electoral votes with 51.8% of the two-party vote, closely matching the unadjusted exit polls. 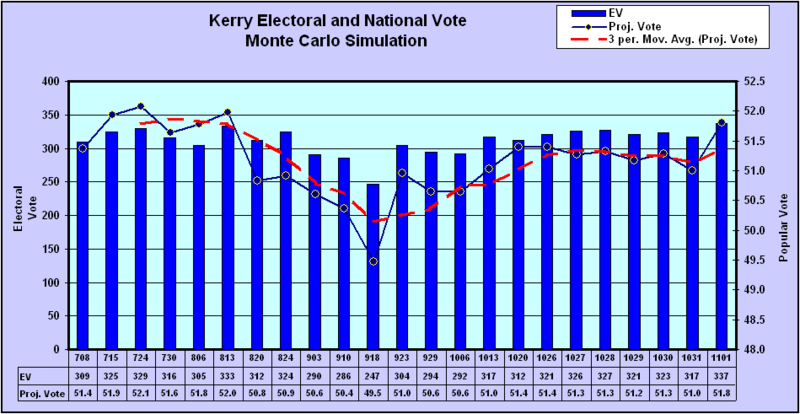 The adjusted 2004 National Exit Poll was mathematically impossible; it was forced to match Kerry’s 48.3% recorded vote (the unadjusted NEP indicated that Kerry had 51.7%). The adjusted poll indicated that there were 52.6 million returning Bush 2000 voters (43% of the 122.3 million recorded). But Bush had just 50.5 million votes in 2000; only 48 million were alive in 2004. Assuming a 96% turnout, 46 million voted. Therefore, simple arithmetic shows that the adjusted NEP overstated the number of returning Bush voters by 6.6 (52.6-46) million. In order to match the recorded vote, there had to be an impossible 110% turnout of living Bush 2000 voters. THE ULTIMATE PROOF THAT THE ELECTION WAS STOLEN IS CONFIRMED BY A) KERRY’S 4 MILLION NEW VOTER MARGIN (22 MILLION NEW VOTERS, NEARLY 60% FOR KERRY), B) 4 MILLION RETURNING GORE MARGIN AND C) 2 MILLION RETURNING NADER MARGIN. KERRY WON BY 10 MILLION VOTES. The post-election True Vote Model calculated a feasible turnout of living 2000 voters based on Census total votes cast (recorded plus net uncounted), a 1.25% annual mortality rate and 98% Gore/Bush voter turnout. It determined that Kerry won by 67-57 million and had 379 EV. Kerry’s unadjusted state exit poll aggregate 51.0% share was close to his 51.7% unadjusted National Exit Poll share. He had 53.5% in the True Vote Model. There was further confirmation of a Kerry landslide. Consider the adjustments made to the 2004 National Exit Poll crosstabs to force a match to the recorded vote. Bush had a 48% national approval rating in the final 11 pre-election polls. The Final adjusted National Exit Poll was forced to indicate that he had a 53% approval rating. He had just a 50% rating in the unadjusted state exit poll weighted aggregate. Given the 3% differential, we can assume that the 48% pre-election approval rating was also inflated by 3% and was really 45% – a virtual match to the True Vote Model. The exit pollsters had to inflate Bush’s 48% pre-election average rating by 5% in the NEP in order to match the recorded vote. There was a 0.99 correlation ratio between Bush‘s state approval and his unadjusted exit poll share. Similarly, the unadjusted state exit poll Democratic/Republican Party ID split was 38.8-35.1%. In order to force the National Exit Poll to match the recorded vote, it required a bogus 37-37% split. The correlation between state Republican Party ID and the Bush unadjusted shares was a near-perfect 0.93. This chart displays the state unadjusted Bush exit poll share, approval ratings and Party-ID. The Final 2006 National Exit Poll indicated that the Democrats had a 52-46% vote share. The Generic Poll Trend Forecasting Model projected that the Democrats would capture 56.43% of the vote. It was within 0.06% of the unadjusted exit poll. In the 2008 Primaries, Obama did significantly better than his recorded vote. The 2008 Election Model projection exactly matched Obama’s 365 electoral votes and was within 0.2% of his 52.9% share (a 9.5 million margin). But the model understated his True Vote. The forecast was based on final likely voter (LV) polls that had Obama leading by 7%. The registered voter (RV) polls had him up by 13% – before undecided voter allocation. The landslide was denied. The Final 2008 National Exit Poll was forced to match the recorded vote by indicating an impossible 103% turnout of living Bush 2004 voters and 12 million more returning Bush than Kerry voters. Given Kerry’s 5% unadjusted 2004 exit poll and 8% True Vote margin, one would expect 7 million more returning Kerry than Bush voters – a 19 million discrepancy from the Final 2008 NEP. Another anomaly: The Final 2008 NEP indicated there were 5 million returning third party voters – but only 1.2 million were recorded in 2004. Either the 2008 NEP or the 2004 recorded third-party vote share (or both) was wrong. The True Vote Model determined that Obama won by over 22 million votes with 420 EV. His 58% share was within 0.1% of the unadjusted state exit poll aggregate (83,000 respondents). In the 2010 Midterms the statistical evidence indicates that many elections for House, Senate, and Governor, were stolen. The Wisconsin True Vote Model contains worksheets for Supreme Court and Recall elections. A serious analyst can run them and see why it is likely that they were stolen. The 2012 Presidential True Vote and Election Fraud Simulation Model exactly forecast Obama’s 332 electoral vote based on the state pre-election polls. Obama won the recorded vote by 51.0-47.2% (5.0 million vote margin) and once again overcame the built-in 5% fraud factor. The built-in True Vote Model projected that Obama would win by 56-42% with 391 electoral votes. But just 31 states were exit polled, therefore a comparison between the True Vote Model and the (still unreleased) state and national unadjusted exit polls (i.e. the red-shift) is not possible. Obama won the 11.7 million Late votes recorded after Election Day by 58-38%. In 2008, he won the 10.2 million late votes by 59-37%. The slight 2% margin difference is a powerful indicator that if a full set of 2012 unadjusted state and national exit polls were available, they would most likely show that Obama had 55-56% True Vote share. But why only recount states that Trump narrowly won? What about states he narrowly lost: NV, MN, NM, CO, NH? The uadjusted polls also appear suspicious in states where they closely matched the recorded vote: CA IL MI TX MN WA NY. Clinton’s CA margin exceeded Obama’s in 2012 by an implausible 7%. Illegals were encouraged to vote by Obama. This is a summary of my 2004-2012 pre-election projections and corresponding recorded votes, unadjusted State and National exit poll vs. True Vote Model. Note that the Election Model forecasts are based on final state pre-election Likely Voter (LV) polls, a subset of the total Registered Voters (RV) polled. The LVs always understate Democratic voter turnout; many new (mostly Democratic) voters are rejected by the Likely Voter Cutoff Model (LVCM). In addition, pre-election polls utilize previous election recorded votes in sampling design, rather than total votes cast. Total votes cast include net uncounted votes which are 70-80% Democratic. The combination of the LVCM and uncounted votes results in pre-election polls understating Democratic turnout – and their projected vote share. It never ends. The media still wants us to believe that Bush won the 2004 election by a 3 million vote margin (50.7-48.3%). They call researchers who proved that the election was stolen “conspiracy nuts”. But they have never debunked the overwhelming evidence that the election was a massive fraud. Even after inflating Bush exit poll vote shares and turnout, a True Vote sensitivity analysis shows that Kerry won all plausible scenarios. It’s time for the media to tell the truth. Kerry won a landslide. The election was stolen, just as like it was stolen from Gore in 2000. The pundits resorted to claims that the exit polls “behaved badly”, Bush voters were “reluctant to be interviewed” by the exit pollster, returning “Gore voters lied” about their past vote and there was no correlation between “vote swing and the exit poll red-shift”. US Count Votes did a comprehensive analysis of the 2004 exit poll discrepancies which disproved the exit pollster’s reluctant Bush responder (rBr) hypothesis. A comprehensive spreadsheet analysis of discrepancies between state and national unadjusted exit polls and recorded votes is overwhelming proof that election fraud is systemic. The Democrats won the 1988-2008 presidential exit polls by 52-42%, but just 48-46% in the official recorded vote. 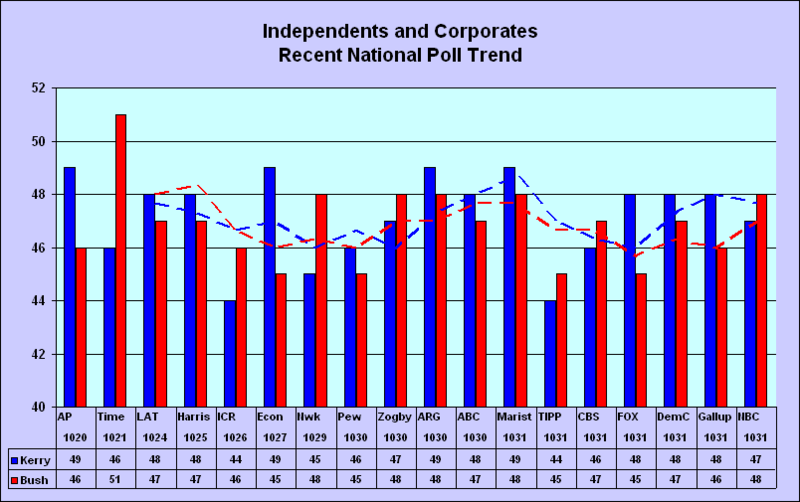 The 2004 National Exit Poll (NEP) displayed on corporate media election websites indicates that Bush was the winner – until one takes a closer look. As we all should know by now, exit polls are always forced to match the recorded vote – come hell or high water. In other words, they always assume zero election fraud. The 2004 NEP indicates that 52.6 million (43%) of the 2004 electorate were returning Bush 2000 voters and 45.1 million (37%) were Gore voters. As we have shown numerous times before, this is an impossible scenario. Bush had just 50.5 million recorded votes in 2000. Gore had 51.0 million. Approximately 5% (2.5 million) of Bush 2000 voters died, so at most 48 million returned to vote in 2004. But 100% turnout is impossible; therefore had to be fewer than 48 million returning Bush voters. Assuming 98% turnout, 47 million returned in 2004. That is 5.6 million less than the 52.6 million indicated in the Final 2004 National Exit Poll. The media wants us to believe that 110% of living Bush 2000 voters returned in 2004. Where did these mysterious phantom Bush voters come from? What does that tell us about the Final? And since the Final was forced to match the recorded vote, what does that tell us about the recorded vote? Unlike the impossible Final 2004 NEP, the 2004 True Vote Model determines a feasible (i.e. mathematically possible) and plausible (likely) number of returning Bush and Gore voters. An estimated 98% of living 2000 voter turned out in 2004. Note: There were 6 million uncounted votes in 2000 (approximately 75% for Gore). Therefore, Gore’s True Vote margin was at least 4 million. But we will be conservative in assuming that he won by just 540,000 recorded votes. Even if we use the bogus 2000 recorded vote as a basis for returning Bush and Gore voters and apply 12:22am NEP vote shares, Kerry is the clear winner of the Base Case scenario. He has 52.2% and a 7.3 million vote margin – with a 97% win probability. Note that Kerry won the unadjusted National Exit Poll (13660 respondents) with a 51.7% share. The Final NEP (also 13660 respondents) has Bush winning 50.7-48.3% (the recorded vote). Let’s use the 2000 unadjusted state exit poll aggregate (Gore had 50.8% and won by 6 million) as a basis for calculating the 2004 True Vote. Kerry’s True Vote is 54.3%. He wins the base case scenario by 12.8 million votes with a 100% win probability. The base case assumes an equal 98% turnout of living Bush and Gore voters. Let’s assume that only 90% of Gore voters and 98% of Bush voters return. Kerry is still the winner by 10 million with a 53.2% share. He also wins the worst case scenario by 3.8 million with 50.8%. Exit poll naysayers insist that Kerry’s early vote shares were inflated and that the Final shares listed on CNN should be used: Kerry’s 57% share of new voters is reduced to 54% and his 10% share of returning Bush voters cut to 9%. We’ll do better than that. View the True Vote Model sensitivity analysis tables. In the worst case scenario, Kerry has just 53% of new voters and 8% of Bush voters. Kerry is still the winner by 5.9 million votes with a 51.6% share and a 94% win probability. 1. Adjustments made to the National Exit Poll in order to match the recorded vote were impossible (required that 110% of living Bush 2000 voters return in 2004). 2. Kerry is a 52.2% winner assuming 98% of living Bush and Gore 2000 voters turned out in proportion to the 2000 recorded vote. 3. Kerry is a 54.3% by 12.8 million votes assuming the 2000 True Vote as the basis for returning voters. 4. 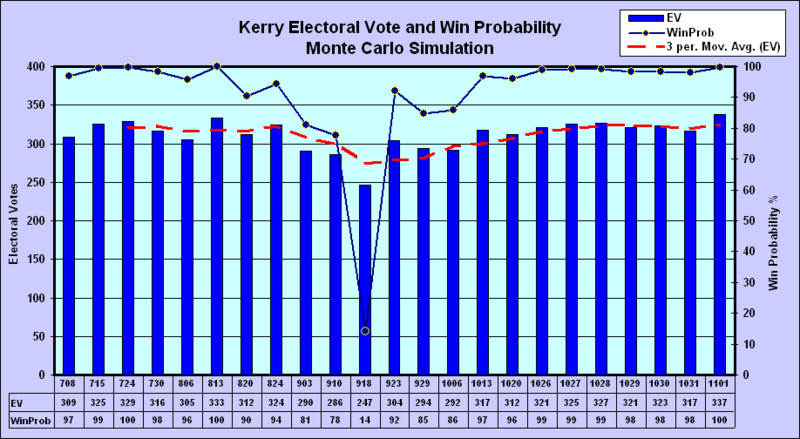 Kerry wins all scenarios – including the worse case in which his shares of returning and new voters are assumed lower than the Final National Exit Poll. 5. Even assuming 98% Bush / 90% Gore turnout, Kerry wins all scenarios. A statistical analysis of 49 Ohio 2004 exit poll precincts was produced by Ron Baiman and Kathy Dopp at U.S. Count Votes. Over 40% of Ohio’s exit polled precincts had statistically significant discrepancies. This is over four times the number of expected precincts with significant discrepancy. • 40.7% (20 of 49) of Ohio’s polled precincts have significant discrepancy when calculated by assuming that exit poll results are a better estimate of real vote share. • 4% (2) of Ohio’s exit polled precincts had an official Bush vote that had less than a 5% chance of occurring. In these precincts Bush official vote share (assumed to be one minus their Kerry share) was much smaller than expected, given Bush’s exit poll share. Will any media pundits, election analysts or political scientists come forward to refute the massive evidence of fraud and prove that Bush really did win a fair election? Don’t hold your breath. Job tenure is everything.